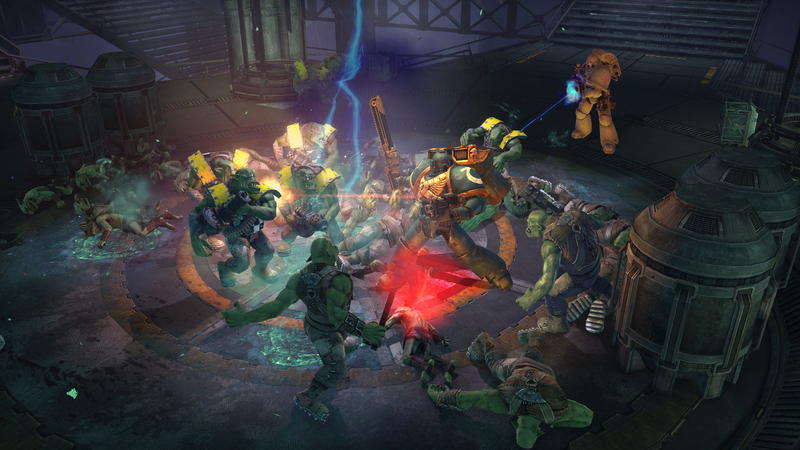 Grab a few friends and chainsaw some Orks as a team in Space Marine's upcoming cooperative missions. Players eager to slash through more hordes of xenos in Warhammer 40,000: Space Marine won't have to wait too long as developer Relic Entertainment has set October 25th as the release date for the game's newest DLC pack. Called "Exterminatus," the new DLC introduce a cooperative mode of the same name that will let players battle together against Orks and other enemies from Space Marine's single-player campaign. Progression made in the co-op mode will apply to players' multiplayer ranking, and bonus perks earned in Space Marine's other modes can be used in the in the team-based setting. Currently the "Exterminatus" DLC has two scenarios lined up, titled "Assault on Hab Center Andreas" and "Escape from Kalkys Facility," which by name alone may give a few hints as to what sort of objectives players should expect to accomplish. Players will be judged on their in-game performance, and may face additional challenges based on their successes. Relic currently has several more DLC packs for Space Marine in the works, and has stated that future downloadable content will be a mix of both free and premium updates.